But as Mr. Sadr has taken a more active role in the government, as many as a third of his militiamen have grown frustrated with the constraints of compromise and have broken off, often selling their services to the highest bidders..
Sadr has modeled his organization on Hezbollah. However, he may have misunderstood the raison d'etre of Hezbollah, which is its ability to win 4G wars against encroaching nation-states. This ability provides it with the legitimacy they need to persist and prosper. Its relief efforts and good works are secondary to military power, and help to balance the organization's image. Political power, at the state level, comes in a poor third (and only serves to provide cover to the organization, despite its non-state status) -- for good reason, political power in a fractured state is of little meaningful value (unless you enjoy failure and frustration). Frankly, if Sadr has inverted this equation and placed political power in the first position, he will quickly find himself without much of a militia left. This is particularly true if Sadr's militia isn't really cohesive like Hezbollah -- most signs point to this -- and it tends towards open source. In that case, the lack of a plausible promise (like: "kick the Americans out") will fork the movement. How could he reverse the slide? Given that 4GW military power is the only source of meaningful legitimacy he can tap, the way to gain power (not official control, but defacto) would be to set himself against the US military. The US is an enemy all can agree on, and any military action against US forces would be likely inflate Iraqi nationalism (a secondary loyalty) across the spectrum. I detailed one way to do that: by blocking its supply lines using a defensive grid (as demonstrated by Hezbollah against Israel) last week. I wonder when (or if) he will figure this out? JOURNAL: Is China a threat? In the past few years, the People’s Republic of China (PRC) has experienced rising social unrest, including protests, demonstrations, picketing, and group petitioning. According to PRC official sources, “public order disturbances” have grown by nearly 50% in the past two years, from 58,000 incidents in 2003 to 87,000 in 2005. Although political observers have described social unrest among farmers and workers since the early 1990s, recent protest activities have been broader in scope, larger in average size, greater in frequency, and more brash than those of a decade ago. Fears of greater unrest have triggered debates with the Communist Party leadership about the pace of economic reforms and the proper way to respond to protesters. Given globalization's tendency to catalyze social fragmentation and the rise of new methods of warfare (my global guerrillas), a meltdown scenario should be considered as a serious possibility. When China's economy does head south (since it is inevitable that all prolonged booms eventually go bust), the government's lack of legitimacy will likely become THE central issue. Also, while some could argue that a pacifist "color" revolution will step into any breach that emerges, I wouldn't put too much faith in it. The government will resist the rise of any mass political movement violently (which explains the state's recent crash effort to build a one million man paramilitary police force), and it will likely be successful in this effort. Instead, the real opposition will come from a reemergence of primary loyalties (loyalty to anything above the state) and their armed defenders: global guerrillas. Here's a quick critique of jihadi strategist Abu Musab al-Suri's "The Call of Global Islamic Resistance" (widely circulated in Arabic, but there is not an english language translation available on the Web for me to link to). A good starting point for exploring this work is Andrew Black's (writing for Jamestown) comparison of al-Suri's work with that of William Lind in The Changing Face of War: Into the Fourth Generation. Andrew claims that al-Suri's work provides organizational improvements in fourth generation warfare (which are akin to what I am working on here on global guerrillas). I disagree. Here's why. Al-Suri's slogan for his treatise -- "system, not organization" -- encapsulates his desire for extreme decentralized at the expense of organizational hierarchy. The objective of this desired decentralization is, obviously, to imbue the Salafi-jihad with vast improvements in survivability and innovation. While the objective is correct, al-Suri's call for decentralization doesn't work in practice within real-world conflicts and organizational structures. Ideological goals vs. operational goals. Al-Suri/Beam/Guevara all assume some level of motivational and methodological purity is maintained in their decentralized organizations without indoctrination from a formal hierarchy. This does not exist in the real world since all war, like politics, is local. In decentralized warfare, it is hyper-local. Open source movements embrace this diversity and set a goal that is typically simple, accessible, and operational (best described as a plausible promise, for example: "we can defeat the US in Iraq"). This goal, without ideological baggage, allows a wide variety of groups with different motivations and backgrounds to join the effort. Further, communication through open means (media/Internet) is available to all participants that have the ability to do so. It isn't the sole province of any ideological leadership. Isolation vs. complex inter-networking. Another assumption of al-Suri is that each group can act totally independent of the movement. Open source movements, in contrast, allow a wide variety of cross connections to quickly share methodological improvements. They even allow the creation of micro-markets that assemble operations through the use of economic interactions. Subsistence insurgency vs. viable economies. Finally, al-Suri leaves the role of funding the ongoing insurgency to the background operations of the individual teams and the occasional infusion of capital from roving violence capitalists (from the main organization). Open source movements are not nearly so shallow. They readily move in and out of economic activity without pause and actively engage in alliances with criminal enterprises (oil bunkering, drug smuggling, etc.). This ongoing activity allows them to not only meet all current needs, it allows them to expand operations. 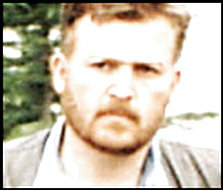 Note: Brynjar Lia, at the Norwegian Defense Research Establishment, has a paper on al-Suri: "The al-Qaida Strategist Abu Mus'ab al-Suri: A Profile." Worth a read. You'll be brought down to your knees if Pakistan doesn't co-operate with you. That is all that I would like to say. Pakistan is the main ally. If we were not with you, you won't manage anything. Autonomy to rebels. After the loss of a reported 3,000 troops, Pakistan has ceded the tribal areas of Waziristan (population: 800,000) to pro-Taliban local rule. Weapons will be returned, outposts will be abandoned, and compensation will be paid. Safe haven for the Taliban. Pakistan has cut a ceasefire with the Taliban's Mullah Omar. Pakistani troops will no longer hunt down the Taliban (and likely al Qaeda) in Pakistan. This ceasefire also prevents US/NATO troops from crossing the border to pursue Taliban forces. Exporting guerrillas to gain good-will. 2,500 Taliban and al Qaeda militants have been released from Pakistani jails (under the stipulation that they will leave Pakistan). Unlike the opposition mounted by Pakistan against the USSR in Afghanistan, Pakistan's ISI is not in control of these forces (they now have a lucrative source of financing: the opium trade). NATO, as the leader of the counter-insurgency in Afghanistan (unlike the USSR before it) will not mount a serious effort. Signs of stress are already evident. NATO will quickly fold under the mounting pressure (which may spell, for all intents and purposes, the end of that treaty organization). The Taliban and al Qaeda are already importing the open source methods of insurgency developed in Iraq to central Asia. These tactics and organizational approaches will work better in Pakistan, due to its level of development, societal complexity and urbanization, than in Afghanistan. As the war in Afghanistan reaches it conclusion, likely sooner rather than later, Musharraf will quickly become the main target. If the global guerrilla playbook is used, these forces will not use direct attacks on Musharraf's person (which have been mounted on numerous occasions in the past). Instead, they will seek to fragment Pakistan's society and economy, which will likely lead to Musharraf's removal from power. Of course, as we have seen, the best method to begin a process of state fragmentation is through the indirect method of systems disruption. A great example of what is possible was revealed on the 24th of September 2006, when a disruption of power from the Tarbela dam shut down electricity across 75% of Pakistan. All guerrillas need to do to achieve Musharraf's removal, and the destruction of US policy in the region, is to repeat the process that led to this outage again and again and again. It's a rudimentary first step. US forces are now in a precarious and untenable position in Iraq. The window of opportunity for an easy exit has passed. Three years of fighting an open source insurgency has destroyed Iraq's economy (through systemsdisruption starting in 2004), worn down US commitment/curtailed operational flexibility (the IED marketplace during 2004/05/06), and forced a country-wide descent into primary loyalties (through a combination of social systems disruption that reached a crescendo in 2006 and an early reliance on loyalist paramilitaries as a force multiplier back in 2004). Iraq is now in full failure and as a result, the assumption that the US will be able to continue with its partial efforts at urban pacification has become dangerously wrong. The reasons should be obvious. US forces are now surrounded by a sea of militias and insurgents. Within Baghdad itself, where the current pacification effort is focused, US troops are badly outnumbered in extremely difficult urban terrain. Worse yet, the opposition is growing in numbers, sophistication, and aggressiveness at a rate more rapid than the static number of US troops can build up the Iraqi military. It is now only a matter of time before either a misstep or a calculated event pushes the countryside into full scale warfare. In this near term conflict, we are likely to see a repeat of the lightly manned defensive hedgehog used successfully by Hezbollah against Israel. That lesson was not lost on this war's open source participants, particularly Sadr's Mahdi Army, which uses Hezbollah as a model (which implies they might try to replicate Hezbollah by translating success on the battlefield into the critical currency of "legitimacy"). If placed along critical US military supply routes or immediately outside US mega-bases, and augmented by informational superiority (a combination of better local intelligence and advanced signals intercepts), these defensive tactics would extract a heavy toll on US troops (even as the US wins a tactical victory). Further, if repeatably successful, these efforts will force the US to forgo all efforts at offensive pacification operations in favor of basic force protection (not only for US troops, but the tens of thousands of civilians on these bases). From that point on, the timer will be on until a US forward base is overrun (when it finally goes off, we will be cooked). Of course, the above outcome grows increasingly likely as the rhetoric for a war with Iran heats up, given that Iran can easily supply the weaponry necessary for these tactics. Since the current US administration's timeline for this new war isn't Iran's nuclear development cycle, but rather the US '08 election cycle (because they don't trust the next administration to make the tough decisions on the issue), this may come into being soon. The arrival of global guerrillas -- small groups that can successfully fight wars against states -- is merely the first expression of a much larger trend line. The larger trend is a radical improvement in the productivity of warfare through the use of mechanisms outside of the control of the state. Since there have been no strides in eliminating the drivers of warfare at the small group level (in fact, just the opposite has happened) and our core systems remain hopelessly concentrated/interconnected, the use of this newly emergent productivity is inevitable. If we follow this trend line, the path in development is clear. First, over the next decade or two, the size of the group necessary for global warfare will continue to decrease and decentralize (through a near term shift to systems disruption and open source organizational forms). Second, we will eventually reach a point when the weaponry available to these groups will enable them to initiate a catastrophic black swan (an event that is impossible to predict). RAND's Charles Meade and Roger Molander provide a great example of a catastrophic black swan in their contemplation of the effects of the explosion of a nuclear bomb, smuggled in a shipping container, at the port of Long Beach CA (PDF). Of particular interest are the cascading effects of such an attack -- such as port closures across the US, which would result the immediate economic isolation of the US for an indeterminate duration. Of course, viewed within the context of a catastrophe like this, it is important to consider the first expression of this trend line (global terrorism using conventional weaponry) as a grace period. History has given us an opportunity to get security right before the next wave hits. So far, it doesn't look like we have learned anything at all. 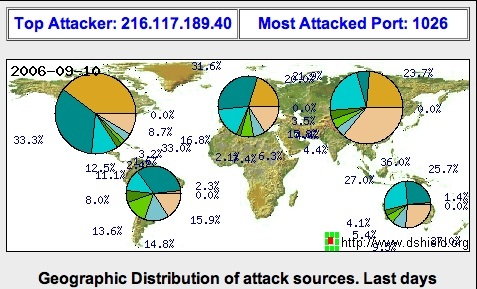 DShield.com, which runs a very cool distributed security monitoring system (by collecting and analyzing firewall logs from thousands of global participants), provides an interesting graphic on the geographic distribution of global cyber-attacks. As an example of bottoms up defensive system design in the absence of any meaningful government presence, DShield.com gets my nod of approval. Of course, the complexity of these attacks (using false fronts, cross border redirections, slaved systems, etc. ), the rapidity of its growth, and diversity of the motives (criminal, maliciousness, etc.) isn't visible in this diagram, but a sense of the breadth is. Activity in the world of electronic security should also be seen as a leading indicator for what will eventually arrive in the physical world as barriers continue to fall. It's as certain as rain. JOURNAL: 35,000 Private Military Shooters in Iraq? PSCAI (Private Security Company Association of Iraq) estimates that there are 35,000 private military contractors (those who are using lethal force and employed by global corporations) in Iraq. Note that the vast bulk of these contractors are operating outside the realm of any counter-insurgency strategy (and by their actions, defined by their missions, typically undermine it). On August 25th 2006, the paranoia of the airline security system reached a peak with eight security incidents that resulted in flight diversions, a handful of preventative arrests, and fighter escorts. The creeping dysfunction of mass airline transportation will almost certainly continue to escalate as future terrorism occurs (whether successful or not). Naturally, the marketplace is already responding to the impending dysfunction. Fractional jet ownership programs have zoomed, since these programs suffer none of the security delays and hassles mass transit endures. A great example is Warren Buffet's NetJets, which has a 50% market-share in the fractional jet industry. It has already expanded to 600 aircraft (equal in size to the world's second largest airline, albeit with much smaller jets) and sports global coverage. This trend is something that will continue as the hourglass demand pattern (where demand is split between super-discount products/retail and a price insensitive high-end) we see in an increasing number of markets becomes the norm in security as well. Rest easy, our business and political elite will not be needlessly inconvenienced (given these market dynamics, it is likely that a better solution achieved through deep system redesign, that would alleviate many of the current problems, will never emerge). Rationalization is something we all do (often daily) when confronted with events that go against our plans and desires. The process is simple. We take a complex event, replete with unknowns, and put it into a framework where everything makes sense to us. The usual output of this process is "if only we had (or not) done this or that..." or "if we had taken this approach (substitute your pet theory here) things would have turned out grand." We are now at the start of a long process of rationalization over the US defeat in Iraq. The most common of these rationalizations include: if only we had "...not disbanded the Baathist army," "...sent in more troops," or "...become better at nation-building." However, in each case the approach is one dimensional, since we tend to view ourselves as the only actors on the stage. The actions and reactions of the opposition are discounted and explained away as fluff and background noise (those pesky terrorists...). A better, and more sane approach, is to embrace the concept that war is a conflict of minds. There are two sides. For every change in approach there will be counters mounted by the opposition. In the case of Iraq, that opposition was extremely difficult to beat since it was organized along the lines of open source warfare. This organizational structure gave it a level of innovation, resilience, and flexibility that made it a very effective opponent. Given this, the simplest explanation for the outcome in Iraq is that we were just beaten by a better opponent (the Israeli's seem to be getting this, why can't we?). The real question we should be asking ourselves is whether or not our maximalist goals in Iraq could ever have been achieved given the capabilities of the opposition and the limited levels of commitment we were able to bring to to bear on the problem. I suspect the answer is no. The goals didn't match our capabilities and there weren't any simple tweaks to our strategy that would have changed the outcome. This was a difficult way to learn this lesson, but given our tendency towards rationalization, I doubt that it will be learned at all. The war in Iraq has catalyzed the growth of the mercenary industry (populated with a wild array of private military/security companies), and serves as yet another sign of the return of the pre-Westphalian warfare documented here. A good way to get up to speed on the topic is to watch the documentary "Shadow Company" by Nick Bicanic and Jason Bourque. It is even-handed and has solid interviews with industry insiders/pundits/analysts like Robert Young Pelton, Doug Brooks, and Peter Singer. Thanks to Kerry for sending a review copy of this great film.